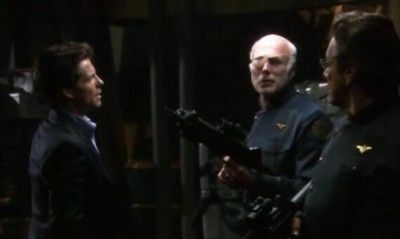 Gaeta and Zarek lead a mutiny against Adama and Roslin and their alliance with the Cylons. An episode up there with the show’s finest. Taking a break from the final season revelations initially seems like madness but, after 45 minutes in which the excitement never lets up, you see there’s genius at work. The episode wastes no time getting into Gaeta and Zarek’s insurrection, refusing to pull punches as you learn that unexpected people (Seelix? Racetrack?) are complicit in the plot. This is no sanitised Star Trek-style mutiny either. People are killed simply for being in the way and crew members are forced to make split-second judgements about where their loyalties lie. It’s also an excuse for some fine character stuff: Lee and Kara, both put through the wringer in recent weeks, fighting alongside one another once more; Adama and Tigh burying their differences in the face of adversity; and Roslin’s realisation that the Fleet really does need her. There’s also one hell of a cliffhanger. How did Gaeta go from idealistic young CIC officer to the leader of a mutiny? The finest character arc in Galactica, bar none. Previous episode . Next episode .